Fear Not - Youth Caucus Presentation from the 2018 Kansas City UUA General Assembly. This program by the Youth Caucus is an example of the kind of programs and messages presented at the gathering. Love over fear. Our PH Thanksgiving program is a not-to-be-missed time of celebration and community, bringing together Pilgrim House members and friends with special music, a performance by the Pilgrim House Chorale, seasonal readings and poetry ... and more. If you or younger members of your family have a musical selection you’d like to share, please contact Bill Rohde by Sunday 11/13. Similarly, if you have a reading you’d like to share, please contact Mel Aanerud. If you would like to sing in the Chorale, the Chorale practices are listed in the Calendar below. And don’t forget to bring a dish to pass for our traditional pot luck feast immediately after the program. See you there! Professor Trygve Throntveit, Development Officer and Dean’s Fellow for Civic Studies University of Minnesota, will speak about his book "Power without victory: Woodrow Wilson and the American Internationalist Experiment." This year’s program is at an opportune time, since the First World War ended at 11 O’clock on the 11th day of the 11th month, 1918 - 100 years ago. Author, photographer and story teller Doug Ohman will be back for the second part of his grand tour of Minnesota’s most beautiful landscapes, buildings and historic sites. He will focus on the Arrowhead and Northern Minnesota. Travel with Doug as he shows photographs many of Minnesota’s most interesting landmarks and icons. Doug will share the stories of how these landmarks became so famous. His pictures and stories will be sure to entertain and bring new interest in more road trips around our great state. Doug is a photographer who has done the series of books of Minnesota churches, cabins, librarians, courthouses, schools, etc. John Watkins is a professor of language on the Mediterranean at the University of Minnesota. Major early great cultures developed around the Mediterranean – he answers why. We welcome Anatoly Lieberman back to Pilgrim House. He is a professor in the Department of German, Scandinavian and Dutch at the University of Minnesota, is the author of numerous books and articles, and has taught all over the world. He will present The Gods of Scandinavia, before Christianity. Rev. Kristen K. Wernecke is the author of Choosing Conscious Health for a Vibrant Life, is an integrative health practitioner, practicing massage therapy and energy healing, since 1990, and is a Wellness Specialist at Hazelden. She will be sharing some techniques for reducing stress and finding personal purpose in this turbulent point in American history. Pilgrim House proudly supports the work of the Community Support Center. We serve on their board, and we are a sponsor of and active participants in the Walk a Mile For our Neighbors fundraiser each summer. TED talks will discuss "Why Design Should Include Everyone" and "Asking for Help is a Strength, Not a Weakness." This program offered by the Fresh Water Society. It will be about things we can do at home to improve water quality. Wherever you live, you can make a real difference in the health of our waters! Master Water Stewards is a program that certifies and supports community leaders to install pollution prevention projects that educate community members, reduce pollutants from storm water runoff, and allow more water to soak into the ground before running into storm sewer systems. The program is a partnership between the Freshwater Society and participating cities, watershed management organizations and non-profits. This annual welcome back program is held each year. Join us in song, readings and sharing revitalized connections and community. Bring a small amount of water from a place that is special to you. One by one we will pour our water together into a large bowl and tell why this water is special to you. The combined water is symbolic of our shared faith coming from many different sources. This presentation will be a fun filled event for the whole family. We will explore the varieties of birds you might find in your own backyard and their unique characteristics. It will be an interactive event filled with humor, knowledge and prizes. Louis Asher and his wife, Lisa Wersal, live in a house which opens up to a wetland in the back – a prime situation for bird watching. However anyone can enjoy our winged friends from a typical yard, park or nature center. Louis retired from 3M Co. (in St. Paul, Minnesota) in 2008 after 39 years and has now devoted time to volunteer on environmental protection issues as well as to enjoy nature. He was president of the St. Paul Audubon Society for two years (2011 – 2013) and is an active member. Potluck lunch at 11:30. All are invited to a picnic-themed meal at Pilgrim House. Our organizers will provide pulled pork sandwiches, lemonade and iced tea. You can bring your favorite picnic side dishes, fruits, desserts, vegetarian entrees, other beverages, etc. No sign-up needed; just join us for for a relaxing meal and good company. Have you ever been to an opera, but wish you knew more about it? Join us for a fun and interactive presentation by artists from Minnesota Opera. Through live performance and engaging lecture, these artists will walk you through the history of opera, the people who make it happen, and a day in the life of an opera singer. Whether you are an opera lover or an opera newbie, you won’t want to miss this opportunity to learn about opera from the source itself. Presented by Pablo Siqueiros, Teaching Artist, Minnesota Opera. Bring a flower from your garden to add to the fellowship bouquet, reflecting the beauty of our diversity and what each of us individually brings to it. Take home a flower from the fellowship representing what the fellowship gives back to each of us. This is a program begun in Czechoslovakia that has been held annually before our summer recess for many years. This is will be a short program followed by the Pilgrim House Annual Meeting. The Annual Meeting will be held in the main hall followed by a taco bar lunch in the fellowship room hosted by the Pilgrim House Board of Directors. Hear a review of last year, plans for next year, and volunteer opportunities, approve a budget, and elect a chair for 2019-2020. For the thousands of people diagnosed every year with life-threatening blood cancers like leukemia and lymphoma, a cure exists. Over the past 25 years Be The Match �, operated by the National Marrow Donor Program � (NMDP), has managed the largest and most diverse marrow registry in the world. They work every day to save lives through transplant. Judy Bloom-Martinez is retiring from Be The Match – her work included being a conduit between donors and recipients. She has traveled extensively to deliver or pickup stem cell products. On any given night in the state of Minnesota, 6,000 youth are experiencing homelessness. Alisha Olson, LSW, is a program manager at The Bridge for Youth, a nonprofit that operates a 24/7 emergency shelter program for youth ages 10-17. Alisha currently is working on her Masters Program at Augsburg University, and will be presenting on the impacts of homelessness for youth, and what it looks like within our community. To really understand the issues we will briefly look at the other systems that impact specifically youth homelessness. Also this morning, the Child Dedication of Josephine Rose Chaffee. He is an author, illustrator, musician, naturalist, wilderness guide, "Minnesota’s renaissance man. He is the creator of the award winning classic children’s book Old Turtle. He publishes critically acclaimed adult titles like Deep Woods, Wild Waters and Paddle Whispers. His two new books are, "Old Turtle: Questions of the Heart" and a new adult book "Deep Woods, Wild Waters: A Memoir" Doug communicates through words and music the inspiration to be found in nature—not as a place to visit, but a place to call home. This is a followup to the well-received February 18 program. Jean Strait and Hamline students will share about, and answer your questions on, microaggressions. Expect discussion on how we can change our language to eliminate them. Students will share personal stories so Pilgrim House can understand the impact these comments have on everyday life. Joseph DeMasi and twin brother John are singer/songwriter/humorists and fellow UU’s. Their song and humor takes on such topics as equal rights for all and finding spiritual fulfillment. Their songs and humor are touching and humorous but always thought provoking and unique! They have presented to over 100 UU fellowships throughout the country from CA to OK, from MN to NY to positive reviews and great acclaim. This is an inter-generational program. Kristen Wernecke – author of "Choosing Conscious Health for a Vibrant Life" is an integrative health practitioner, practicing massage therapy and energy healing since 1990. She has also been trained in Chi Gung healing, Emotional Freedom Technique, Psychic Development, Cranial-Sacral therapy and Healing Touch. Kristen teaches classes on Meditation, Chakras, Energy Healing and Mind, Body, Spirit Healing, and is a Wellness Specialist at Hazelden. She will be sharing some techniques for reducing stress and finding personal purpose at this turbulent point in American history. Jim Kimball was the reporter from the Star Tribune who covered the Congdon murder and has written a book about it. He has inside information that is almost funny, if it wasn’t .... well a murder. History Theatre of Saint Paul’s production of "Glensheen: The Musical," is returning July 5-29 – It is a hoot, and is based on this book. Hear the back story of this major news event. We are looking for members of the fellowship who would like to be part of the program. If you sing, play an instrument, dance, act, read and/or tell good stories, contact Mel Aanerud to be part of the program. The Pilgrim House Chorale will also perform. Following the program will be Soup Sunday with other accompanying foods for a springtime lunch. All are invited! Tom Hanson is former Foreign Service Officer who has spoken at Pilgrim House several times, both as part of the Great Decisions programs as well as on Sunday mornings. Tom is one of the most sought-after commentators on Foreign Policy in the Twin Cities. He will discuss his view of the dramatic changes made by the Trump administration to our international alliances, trade agreements, and moral leadership around the world. Roberta Walburn is an attorney and author of the new book Miles Lord: The Maverick Judge Who Brought Corporate America to Justice. This is the story of Miles Lord (1919–2016) who rose from humble beginnings on Minnesota’s Iron Range to become one of the most colorful and powerful judges in the country, described as "an unabashed Prairie populist" and "a live-wire slayer of corporate behemoths, he came of age alongside a cadre of young Midwestern social-gospel progressives, including Hubert H. Humphrey, Eugene McCarthy, and Walter Mondale. Project Zawadi’s mission is to support Tanzanian children in achieving their desired educational goals in order to live fulfilling and productive lives. Project Zawadi pursues this mission by working to significantly improve educational quality, safety and access for students in our program area. Through a network of local Tanzanian teachers, Counselors, students and families get the support they need for success. There will be a program on the legislative aims of the Joint Religious Legislative Coalition and an invitation for any and all to participate in a day on the hill to meet with your state legislative delegation and convince them that the aims of this coalition, of Jewish, Lutheran, Catholic and Unitarian Universalist congregations, is worth their votes. Last year over 600 people attended. We are looking to increase that number and hopefully have more influence. Additionally, there will be some ideas on how to be more effective at lobbying your state legislators. This will be a shortened program, so we can have lunch and start the auction by noon. What is gender? Gender is the way we experience our bodies, how we identify ourselves, and how we express ourselves. Traditionally, gender has been on a binary- male and female. My body is male, I identify as male, I express myself as male. Or female. This is a binary that many assume to be based in genetics. But it is not. There are people all over the gender spectrum. If we think in terms of male and female, people may identify as both male and female, neither male nor female, sometimes male sometimes female. But people may also not even include male or female – no gender. Let us be in conversation about dismantling the binary. Jane Smith is a ministerial intern at First Unitarian Society of Minneapolis and a student at Meadville Lombard Theological School. Sometimes, casual comments we don’t think about can be just as damaging as obvious racial slurs. These kinds of comments are called Microaggressions. When talking about racism, we usually think of open racial insults and prejudices as examples, but unintentional things like making assumptions about a person of color’s background based on stereotypes can have a "constant, continual and cumulative" effect. Jean Strait and a panel of Hamline students will come and share with us what microaggressions are, how we identify them, and how we can change our language to eliminate them. The speaker is Lois Mineau (Meno). Dennis Jones is her mentor/teacher and friend on the healing spiritual path. Lois is a Sweat Lodge Keeper in Annandale, MN. She is Ojibway. (Dennis Jones had to cancel, but Lois agreed to speak). This talk will be about Lois’s experience with a Native American Fast on an island in Ontario without food or water for several days. As "Me too" survivor I never could trust the spirit that guides completely. Is the creator really available? Is the creator dependable? Can the creator be trusted? The fast was my attempt to face my fear of darkness and lack of faith in the creator. Over the last several years the Unitarian Universalist Association has been on a rigorous mission to confront and transform its own institutional structures and congregational cultures and practices that have marginalized and excluded people of color. The UUA has made a serious reckoning to the mistakes made during the Black Empowerment Controversy in the late 1960’s. My talk will include perspectives from the UUA book read, Centering: Navigating Race, Authenticity, and Power in Ministry," edited by Mitra Rahnema and "Race in Minnesota: A Good Time for the Truth," edited by Sun Yung Shin. Stephanie McCullough-Cain is a 2016 graduate of United Theological Seminary and is working toward fellowship in the UUA as a Chaplain. The 500th anniversary of Luther’s Theses at Wittenberg fell in 2017, and the 450th anniversary of the Edict of Torda falls in 2018. The 50 years intervening between Wittenberg and Torda witnessed a revolution in the cultural and spiritual life of Europe and Western Civilization. 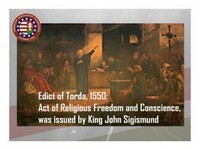 The Edict of Torda, promulgated in the unlikely province of Transylvania, has become one of the defining moments of Unitarianism, and while modern UUs have attached a rather overly-heroic mythology to that event, it remains a remarkable moment in the history of religious freedom -- one whose lessons we are still fighting to realize even today. This program examines the background that led to that moment, and what it really meant in the context of the religious upheaval in Europe of the 16th century and beyond. The sixth UU principal sets "the goal of world community with peace, liberty, and justice for all." In this "mostly music" service, Pianist/Composer Larry McDonough and Saxophonist/Poet Richard Terrill will offer contemporary poems and songs from the folk and jazz traditions that instruct and inspire in the pursuit of resistance to power. You are Wonder Woman! You are Superman! You just don’t always feel very courageous. Many of us feel small, helpless and ineffective against the powerful-worldly forces. There seem to be a lot of "tall buildings" in our way these days. We are smack dab in the middle of some very tumultuous times--on multiple levels. It is time to be courageous and access our super powers. And there is always that kryptonite, those things that make us weak. What if our strength was not where we thought it was? What if our power was somehow hiding in our weakness? And what can we do, practically, about our current dilemmas? Come prepared to explore the questions. Travel with photographer/storyteller Doug Ohman as he photographs many of Minnesota’s most interesting landmarks and Icons. Doug will share the stories of how landmarks became so famous. His pictures and stories will be sure to entertain and bring new interest in more road trips around our great state. Doug has shared many of his books with Pilgrim House. He has done the series of books of Minnesota churches, cabins, librarians, courthouses, schools, etc.